Visit the official GCET website and download the form. Choose exam center and enter all the required details. Submit the form at the center along with three identical photographs. GCET 2019 is conducted by DTE under the regulation of Goverment of Goa. Candidate have to rank good to get admission in any Professional Degree Course in Goa. But before that candidate have to fill the Application form carefully. If the candidate has a very good rank and the information provided by the candidate is incorrect then DTE will not allow candidate for counselling (DTE will reject the student in counselling prosess) for any cources. So, before starting registration carefully read the instructions and steps first. No. of Forms: Three Application Form will be issued for GCET 2019. It will be recognized as Form-A, Form-B, and Form C. Candidates are required to fill Form-A to apply for Engineering & Pharmacy, while Form-B is to apply for MBBS/ BDS/ AHS/ BHMS/ BAMS/ Nursing through NEET UG and Form-C is to apply for B.Arch through NATA. Registration Fee: Candidate should pay a registration fee by Demand draft for INR 1800/- payable at Panaji, in favour of “Director of Technical Education” drawn on any Scheduled Bank, or any other approved form of remittance, as may be duly notified. 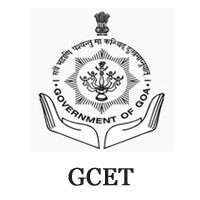 How to fill GCET/ GOA CET 2019 Application Form? Candidates need to visit the official site of DTE Goa (dte.goa.gov.in). From the official website of DTE candidate get the GCET Application form in pdf. 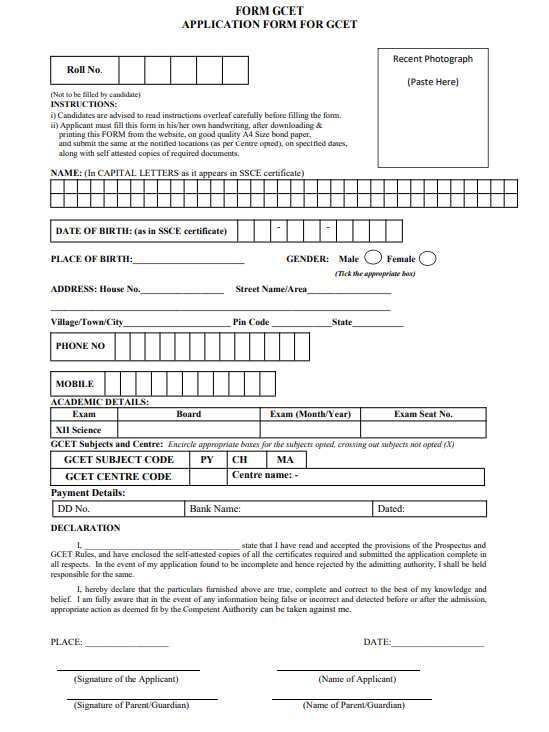 Candidate have to download the form and take print out of the pdf form in a4 sheet. Personal details- Name (in capital letters), date of birth, place of birth, gender. Communication details- Address, street name/area, village/town/city, pin code, state, phone number, and mobile number. Academic details- Class 12 Board name, exam (month/year, exam seat number). Exam details- GCET 2019 subject code, centre code, centre name. Payment details- Demand draft number, bank name, the date on which the DD was issued. Signature and photograph- Candidates have to affix a recent passport-sized photograph and signatures of their as well as their parents/Guardian. Candidates have to pay Application Fee of INR 1800 in the offline mode (online is not available). The fee payment has to be done through demand draft with the validity of at least 3 months from the date of issue. The DD has to be drawn in the favour of " Director of Technical Education, Panaji, Goa " on any Scheduled Bank (currently HDFC is sheduled). Those candidates who are submitting the application form after the specified date have to pay an additional fee of INR 1500. After the last date of submitting the GCET application form with the late fee, no form will be further be accepted. After fulfilling all the details, payments and required documents of GCET Application Form 2019, candidates have to submit it in person at the notified locations as per the centre opted on the specified dates which will be announced by DTE, Goa in their official website. And at the time of submission of application form the authorised person (who is accepting application form) will issue GCET Admit Card. Candidate have to collect the Admit Card on the time when he/she is submitting the Application Form. 3 passport size photographs. The photographs should not taken within 3 month before filling the application form.